James Moffat’s Nissan Altima will run with primary backing from electronics firm Toshiba starting at this weekend’s UBET Perth Super Sprint. The sponsorship, for which a duration has not been made official, was launched by the team via a demonstration drive through the streets of South Perth this morning. An existing team sponsor and long-time supporter of Moffat, Toshiba moves onto the doors of the #99 Altima through a partnership with Intel Security. A newly announced deal sees Intel’s McAfee antivirus software pre-installed on selected Toshiba products. The V8 Supercars push from McAfee comes after the company’s recent recruitment of marketer Matthew Drake, who had been instrumental in antivirus rival Norton’s previous Nissan sponsorship. Nissan Nismo meanwhile takes over the bonnet of Moffat’s entry, supplementing its full-car branding on Michael Caruso’s Altima. Moffat heads to Barbagallo 20th in the championship with a best finish of seventh across the season’s opening six races. 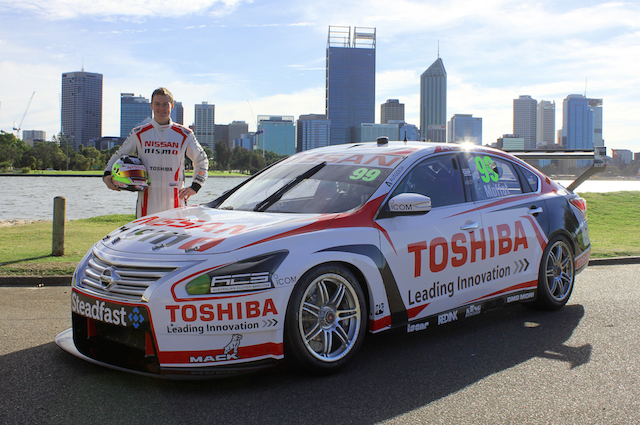 “It’s great to have the support of Toshiba during this next phase of the V8 Supercars Championship,” he said. “Toshiba has been a long-time backer of myself and Nissan Motorsport so to be able to take them to the next level is something that I’m really proud of. “We kick this new deal off at Perth’s Barbagallo Raceway… it’s a circuit that I real enjoy.